I have never been one of those Bucket List kind of people. Sure, there are things I’d like to do before I die, but I don’t have an itemized list of things like sky diving, swimming with sharks or anything else crazy like that. Those kinds of lists just never really interested me. But then I moved, discovered Kerry and her blog about all things Memphis, and realized that maybe having a Bucket List would be a good idea… a Food Bucket List. I had already armed myself with some of Best Memphis Burger’s suggestions, but I needed something besides burgers to help me get a more diverse taste of the Bluff City. Sorry Seth. 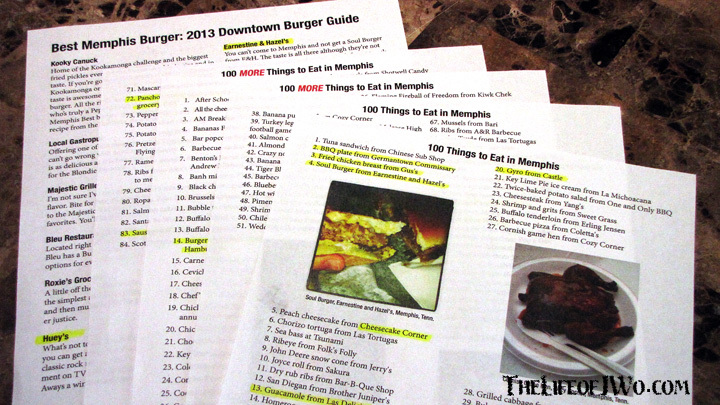 Over the past two years, Kerry has compiled two lists of 100 Things to Eat in Memphis, which I have printed out and have hanging on our fridge, serving as my culinary road map around the city. My Food Bucket List for Memphis. I’ve already been to several of the locations on the lists which, for the most part, don’t include places or dishes that already well-known in Memphis. I’m going to eventually write about some, but not ALL, of the places we’ve visited. I’m a little behind right now, what with all of the eating that’s been going on. The night I brought the lists home Tammy spent literally TWO hours looking up the places and reading the menus to me. She only made it through the first 25 before I told her to take a break. I know there is no way we will ever fully complete the list. Not from lack of trying, mind you, but more because there are some things I just will never order. For example, the first item on Kerry’s original list, Tuna Sandwich from Chinese Sub Shop, is never going to happen. While I’ve heard great things about the Chinese Sub Shop, I know I will never order tuna fish there. I don’t even like eating tuna fish at home, so there’s no way I’m ordering somewhere, especially when there are other options available. However, when I DO finally eat there, I will mark the place off my last, just not the actual item. Another example of something I’ll never order would be the Barbecue Tofu Nachos from R.P. Tracks. But since I’ve been to R.P. Tracks five six SEVEN times now and sat by someone who actually has ordered those nachos, then I can mark R.P. Tracks off my list. I have been to a few more places than Tammy at this point, simply because I have gone to some locations for lunch with my coworkers. But we are slowly starting to work our way through it together. We typically plan on hitting at least one place over the weekends, usually Saturday night, which means it will be a long time before we make a dent in the list. Since I’m now on the other side of 40 I know that my metabolism is not as fast as it used to be, which means I need to start doing something(s) to burn some calories, especially considering how fast we are working our way through the lists. Click the link to see all of Kerry’s lists 100 Things to Eat in Memphis, 100 MORE Things to Eat in Memphis. Click see Best Memphis Burger’s Downtown Burger Guide. Seriously a big thanks to Kerry and Seth for the hard work that went into their lists. Much appreciated. Gallery | This entry was posted in Daily Life, Food and tagged Bucket List, cooking, daily life, eating, family, food, humor, local, Memphis, Postaweek2013, relationships. Bookmark the permalink. I wish I had half as many good places to try here in NC. HAHA… You prolly do, you just don’t have someone compiling a list for you like Kerry did.